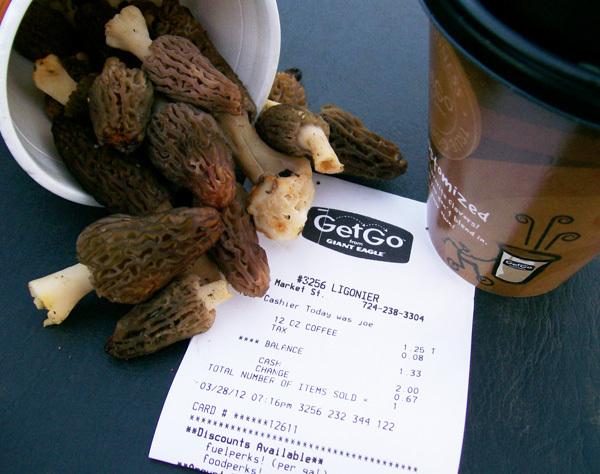 Black morels, white morels, grey's, rubbernecks, peckerheads, blond's, red's, half-free's, yellow morels, longnecks, etc., etc. Many names. All very confusing. Even mycologist can't agree with much of the taxonomy. Even with names like Black Morels and Yellow Morels the colors within a 'type' can vary greatly throwing more confusion into the mix. 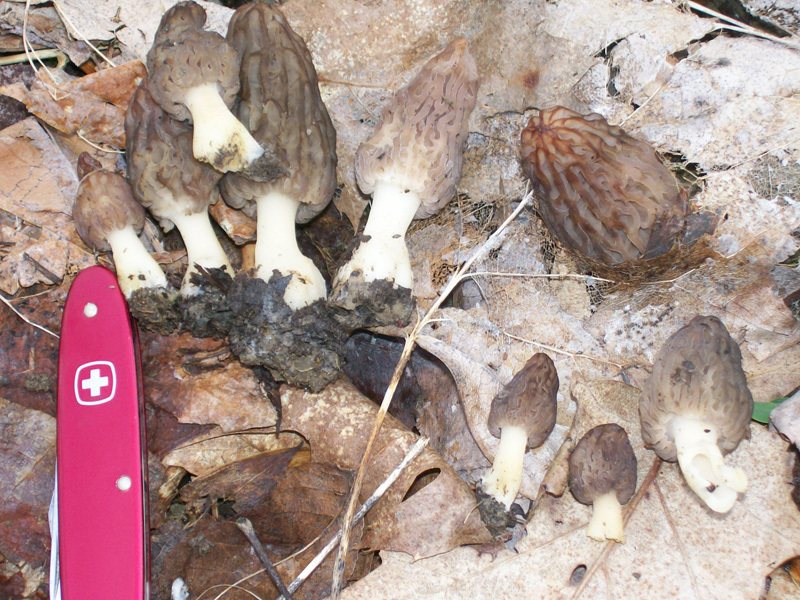 The top row shows variations in the Black Morels. Some are more black some are brown. 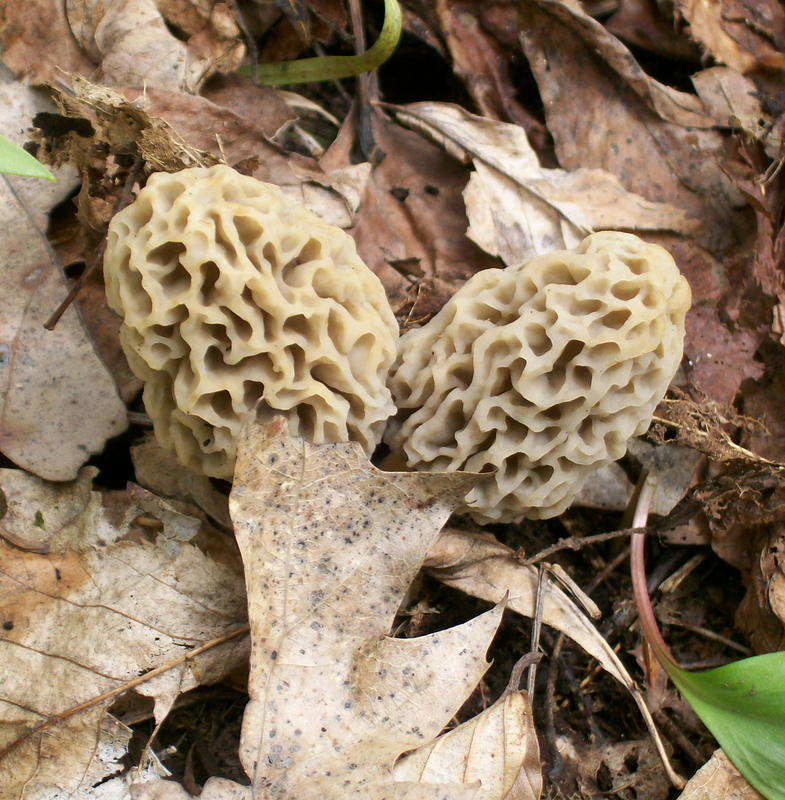 The bottom row appears as if there is a White Morel and a Yellow Morel but they are both Yellow Morels. Some mycologist's say there are only three different types of true morels and other mycologist's say there are dozens. 3. AND, You have to develope - 'Morel Eyes'. What makes it even a bit more difficult is that often, both the time and the associated trees have to be together. You can for example be in the perfect habitat, conduct searches several times over several days in that habitat and be unsuccessful, possibly because you are too early or possibly too late already. OR, you just did not see it. 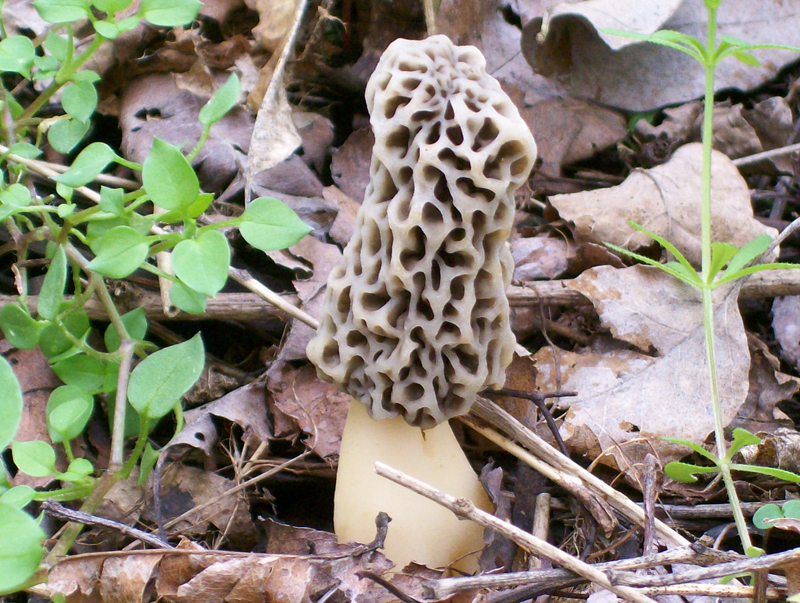 It is finding that first morel of any day's hunt that is the most important. It is that first one that gives you the confidence that they are around and YOU CAN find them. So what constitutes a really good habitat? Although morels have been reported to have been found virtually anywhere, even where totally unexpected, there are some habitats that stand out. An area that has several of these species intermixed, if you can find it, would be perfect. 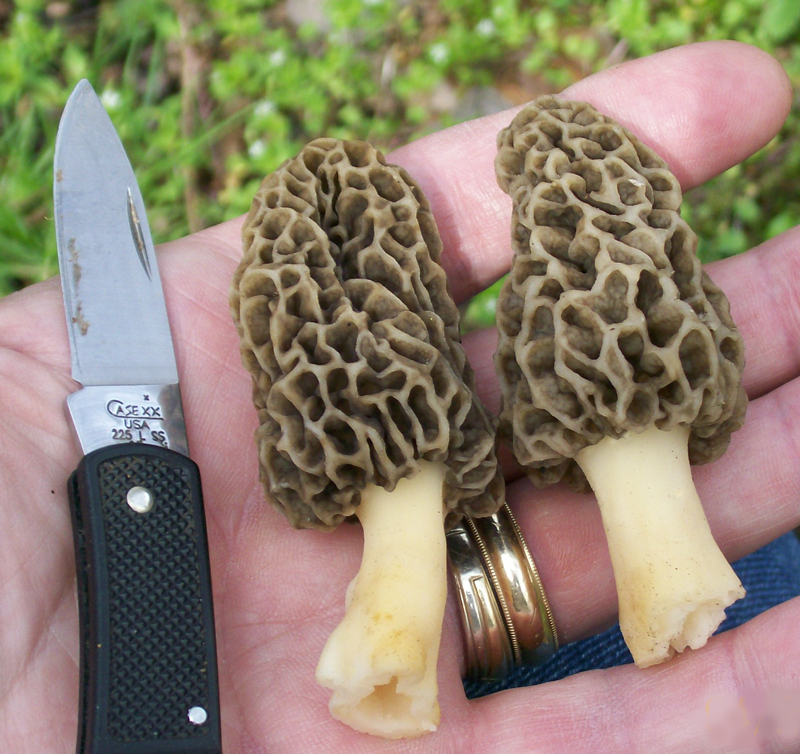 If you are diligent - very diligent - and search in the proper habitat and if the weather is of the proper type, you can start finding little Black Morels as early as late March. I have found them as early as March 28. The Blacks are usually the first species to make their appearance. Black Morels found on March 28. Look at the receipt's date. 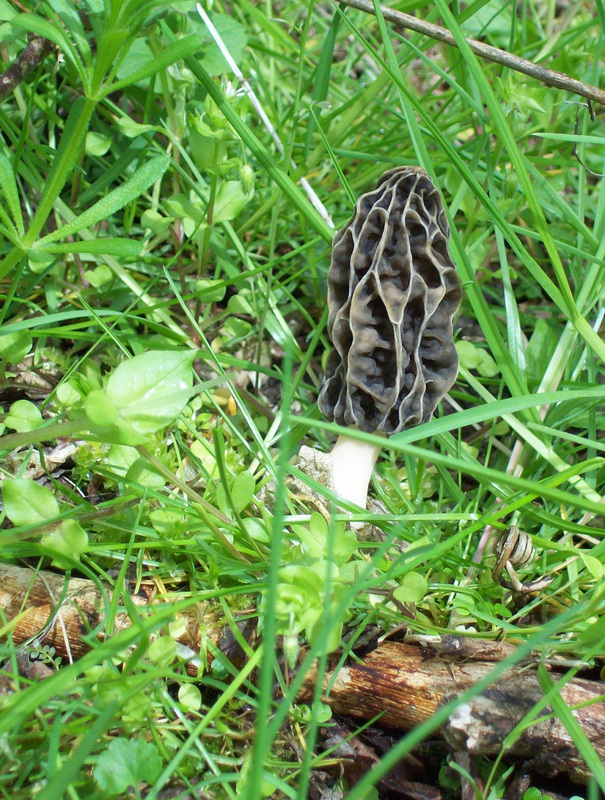 Some people though just can't seem to 'see' the small, black morels, even when looking directly at them. Every wild mushroom picker probably knows someone like that. If you're searching in late March or early April, for instance in stands of trees which are predominately tulip poplar like the photos further down show, you will need to train your 'Morel Eyes' to be alert for darker colors and smaller treasures. Black morels are difficult to spot because their coloring is almost the same as the dead and dying leaves. Look at the next photo and note the colors and hues of the leaf / debris and compare that to the morels. It's camouflage that is hard to beat. Plus they are usually smaller. Plus - you are looking down at them while searching so you are only seeing a small portion of the top of the morel as you are walking along. These are really difficult to spot unless you have 'Morel Eyes'.